hollywoodnews.com: Alexander Payne and Jim Burke’s creative collaboration dates back to 1999’s “Election,” a comedy starring Reese Witherspoon and Matthew Broderick that helped define the director’s razor-sharp wit and keen observational voice. Nearly 15 years later, they’re back with “The Descendants,” an equally witty and insightful human drama starring George Clooney that has been enjoying more than enough awards-season buzz. In fact, according to the pundits, if any film can upset “The Artist” in the Oscar race, it’s Payne’s latest. HollywoodNews.com: Long before “The Descendants,” you produced such outstanding films as Tamara Jenkins’ “The Savages” and Alexander Payne’s earlier drama, “Election.” These are complicated, difficult stories of characters at real crossroads. Are you looking for parallels to your personal life when contemplating material to produce? Jim Burke: You know, the process of just talking about “The Descendants,” any movie sort of becomes revealing about one’s self. [Laugh] I learn as much about myself as I do about … speaking for me, I think a lot of our decisions are done subconsciously. HollywoodNews.com: And do you feel that you support these types of films because there aren’t enough smart, adult options at the theaters these days? Yeah, yeah, I do feel that way. But the business, the way it operates right now, is not set up for films like that, “The Savages” or films like that. Producers have choices we need to make. And sometimes, maybe, we make choices for not the right reasons. Sometimes you make a movie because you have bills to pay or a kid to send through college. Things like that. Those are the films that the people who have all of the money want to make. Personally, I know that that consideration comes with the territory. I learned very early on that the selling starts with the word, “No.” [Laughs] I hear “no” all of the time. But if I have something that I really believe in. Those “no” answers are like rocket fuel for me. They empower me, because that “yes” feels that much better. HollywoodNews.com: Logistically, is Hawaii a complicated location in which to shoot? Well, logistically, it’s biggest problem is that it’s far away. And not just that it’s far away, but once you get there, it’s expensive to stay there. So just the everyday kind of things are a little bit more expensive. The housing gets more expensive, so there’s that added cost. But the real truth of it is that a lot of movies shoot there. You just don’t know it. “Pirates of the Caribbean” was filmed there. “Tropic Thunder” and a lot of Adam Sandler movies were filmed there. HollywoodNews.com: But in precious few of those was Hawaii as essential a character as the state was in your film. HollywoodNews.com: Back to the Oscar race for a minute. 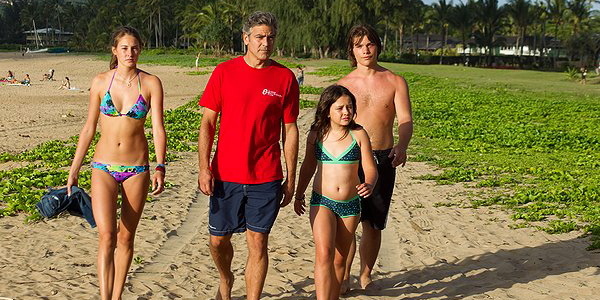 “The Descendants” has been a prominent player in the awards race since its debut in Telluride. Practically speaking, what does awards recognition mean for ticket sales and a film’s bottom line? It means a lot, really. And it validates the people who believed in us. When you make a movie, you have to go to someone for help with production and distribution, and they have to make a decision. Part of that decision depends on the movie, and part of that decision depends on the people who are going to make it. So it feels wonderful that their belief and trust was rewarded. HollywoodNews.com: It also, I assume, helps is opening the next door for you. Oh, it does. And not just for us, but for other people who are making movies that are not sequels or based on bestsellers.